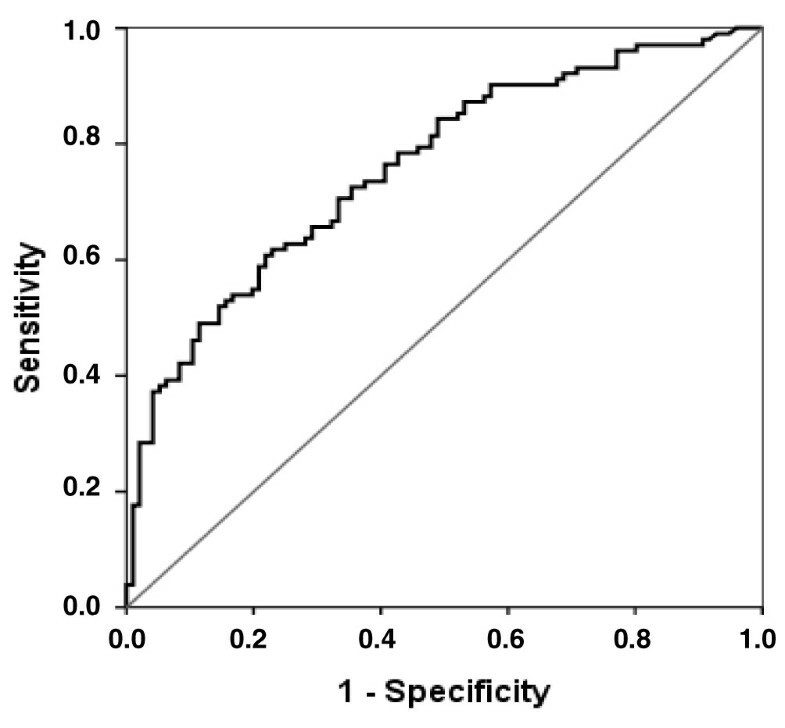 The purpose of this study was to assess the accuracy of N-terminal-pro-B-type natriuretic peptide (NT-proBNP) as a diagnostic tool to recognize acute respiratory failure of cardiac origin in an unselected cohort of critically ill patients. We conducted a prospective observational study of medical ICU patients. NT-proBNP was measured at ICU admission, and diagnosis of cardiac dysfunction relied on the patient's clinical presentation and echocardiography. Of the 198 patients included in this study, 102 (51.5%) had evidence of cardiac dysfunction. Median NT-proBNP concentrations were 5,720 ng/L (1,430 to 15,698) and 854 ng/L (190 to 3,560) in patients with and without cardiac dysfunction, respectively (P < 0.0001). In addition, NT-proBNP concentrations were correlated with age (ρ = 0.43, P < 0.0001) and inversely correlated with creatinine clearance (ρ = -0.58, P < 0.0001). When evaluating the performance of NT-proBNP concentrations to detect cardiac dysfunction, the area under the receiver operating characteristic (ROC) curve was 0.76 (95% confidence interval (CI) 0.69 to 0.83). In addition, a stepwise logistic regression model revealed that NT-proBNP (odds ratio (OR) = 1.01 per 100 ng/L, 95% CI 1.002 to 1.02), electrocardiogram modifications (OR = 11.03, 95% CI 5.19 to 23.41), and severity assessed by organ system failure score (OR = 1.63 per point, 95% CI 1.17 to 2.41) adequately predicted cardiac dysfunction. The area under the ROC curve of this model was 0.83 (95% CI 0.77 to 0.90). NT-proBNP measured at ICU admission might represent a useful marker to exclude cardiac dysfunction in critically ill patients. B-type (brain) natriuretic peptide (BNP) is a neurohormone that is secreted in response to volume expansion and pressure overload of cardiac ventricles. It has been reported that measurements of BNP and N-terminal-pro-B-type natriuretic peptide (NT-proBNP) are sensitive and specific tests for the diagnosis of heart failure in the urgent care setting [1–6]. In addition, BNP measurement was shown to be superior to clinical judgment in the identification of cardiac heart failure, regardless of the threshold value . However, BNP concentrations frequently are elevated in critically ill patients, and several pre-existing conditions, including advanced age and renal failure, might influence BNP concentration . Few studies have addressed the diagnostic value of natriuretic peptides in the ICU. This preliminary study aimed to evaluate the accuracy of NT-proBNP measured at admission to the ICU as a marker of cardiac dysfunction in a heterogeneous group of critically ill patients. The secondary objective of this study was to evaluate the impact of age and creatinine clearance on the performance of NT-proBNP as a diagnostic marker. We prospectively included consecutive adult patients (> 18 years old) who were admitted to the medical ICU of the Dijon Hospital between 1 September 2003 and 31 March 2004. Patients with end-stage chronic renal failure (that is, patients with chronic renal failure requiring renal replacement therapy) were excluded from the study. This study was approved by our institutional review board (IRB), and each of the included patients or next of kin received written information and gave oral consent. Our IRB waived the need for written consent. Plasma levels of NT-proBNP were measured with the Elecsys Electro-chemo luminescent assay (Elecsys 2010; Roche Diagnostics, Basel, Switzerland) according to National Committee for Clinical Laboratory Standards guidelines and International Federation of Clinical Chemistry and Laboratory Medicine quality specifications for BNP methods. This test had a coefficient of variations of 3.2% to 2.4%, from 175 to 4,962 ng/L, with an analytical range of 5 to 35,000 ng/L. Cardiac dysfunction was defined as any degree of respiratory insufficiency (acute or acute on chronic hypoxemia requiring oxygen therapy or mechanical ventilation) caused by a systolic or diastolic cardiac failure that requires inotropic drugs and/or diuretics. Diagnoses were based on clinical and radiographic findings and were validated by an echocardiography performed in each of the patients. These diagnoses were validated by two of the authors (IC and J-PQ) at the time of patient discharge. These physicians were unaware of the NT-proBNP measurement results. Echocardiography was performed in each of the patients. Left ventricular (LV) volumes were measured in the apical four-chamber view with the area-length method. The LV ejection fraction (EF) was calculated with standard formulas. Systolic LV dysfunction was defined as an EF of less than 50%. In patients with conserved LV EF, the evidence for diastolic dysfunction was considered as a documented cardiac dysfunction. To evaluate diastolic function, the thickness of the septal and posterior walls of the left ventricle and its internal dimensions were measured. The transmitral flow velocity was measured with the use of pulsed-wave Doppler, and the peak velocities of the E wave and A wave were measured. The ratio of these velocities, the E-wave deceleration time, and the isovolumetric relaxation time were measured in order to detect diastolic dysfunction. Electrocardiogram (ECG) modifications were defined as ST changes or T-wave inversion. Acute renal failure was defined by creatinine clearance, which was calculated at ICU admission with the Cockroft-Gault formula. Simplified Acute Physiology Score II (SAPS II) and organ system failure (OSF) score were calculated at admission [8, 9]. Sepsis was diagnosed by using the criteria developed at the American College of Chest Physicians/Society of Critical Care Medicine consensus conferences . Individual organ failure was defined according to the OSF score . Results were reported as medians and quartiles (interquartile ranges) or as numbers (percentages). Categorical variables were compared by using the chi-square test or Fisher exact test, and continuous variables were compared by using the non-parametric Wilcoxon test or the Mann-Whitney test. Logistic regression analyses were performed to identify variables that were associated significantly with cardiac dysfunction, as measured by the estimated odds ratio (OR) with 95% confidence interval (CI). Variables yielding P values of less than 0.20 in the bivariate analyses were entered into a forward stepwise logistic regression model in which cardiac dysfunction was the variable of interest. The covariates were entered into the model with critical removal P values of 0.1. Colinearity and interactions were tested. The Hosmer-Lemeshow test was used to check goodness-of-fit of the logistic regression. A receiver operating characteristic (ROC) curve that depicted the relationship between the proportion of true positives and the proportion of false positives was drawn, depending on the prediction rule used to classify the patients as having cardiac dysfunction. A 2 × 2 table was calculated to determine the sensitivity and specificity. Cutoff values, which were defined as the threshold values that maximized the sum of sensitivity and specificity, were determined for each score with the ROC curves. The positive likelihood ratio (LH) was computed to further evaluate the test performance. Indeed, in order to depict the input of NT-proBNP more precisely, we computed the LH in order to describe its ability to modify probabilities of having a specific diagnosis (prevalence of the disease in a specific population, for example) before the result of a test is known (named pre-test probability) into a post-test probability, which takes the result of the test into account [11, 12]. All tests were two-sided, and P values of less than 0.05 were considered statistically significant. Statistical tests were performed with the SAS 6.12 software package (SAS Institute Inc., Cary, NC, USA). Between September 2003 and March 2004, 198 consecutive patients fulfilled the inclusion criteria. Patient characteristics are summarized in Table 1. Median NT-proBNP concentrations were 5,720 ng/L (1,430 to 15,698) and 854 ng/L (190 to 3,560) in patients with and without cardiac dysfunction, respectively (P < 0.0001). In addition, NT-proBNP concentrations were correlated with age (ρ = 0.43, P < 0.0001) and inversely correlated with creatinine clearance (ρ = -0.58, P < 0.0001) (Figures S1 and S2 of Additional data file 1). Data are presented as medians and quartiles (interquartile ranges) or as numbers (percentages). CI, confidence interval; ECG, electrocardiogram; ICU, intensive care unit; NT-proBNP, N-terminal-pro-B-type natriuretic peptide; OSF, organ system failure ; SAPS II, Simplified Acute Physiology Score II . The area under the ROC curve was 0.76 (95% CI 0.69 to 0.83) (Figure 1). Performance of NT-proBNP in patients with and without acute renal failure is reported in Additional data file 1 (Figure S3a, S3b). In the overall population of patients, NT-proBNP of less than 500 ng/L predicted the absence of cardiac dysfunction with a sensitivity of 89% and a specificity of 43%. 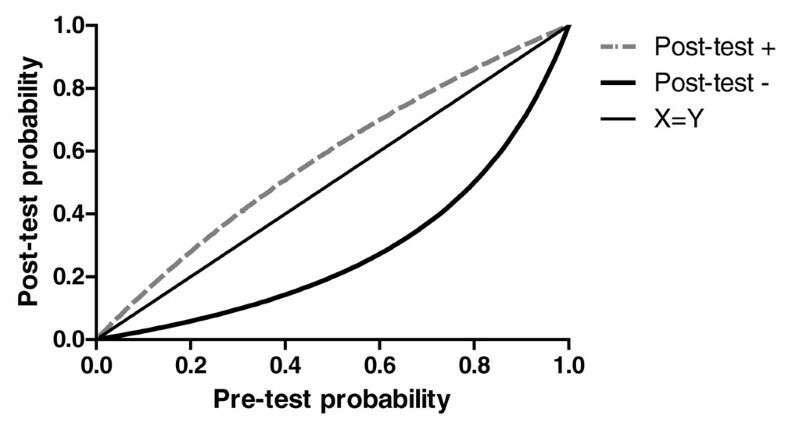 In accordance with the obtained LHs (positive LH = 1.55, negative LH = 0.25), Figure 2 depicts the ability of an NT-proBNP to modify probabilities of having a cardiac dysfunction and therefore to convert the estimated probability of the suspected diagnosis before the test result was known (pre-test probability) into a post-test probability, which takes the result into account. For example, for a pre-test probability of having a cardiac dysfunction of 20%, a negative result of the enzyme-linked immunosorbent assay test for NT-proBNP would produce a post-test probability of 5.8%. Conversely, for a pre-test probability of 70%, a negative result would yield a post-test probability of 37%. Receiver operating characteristic (ROC) curve for N-terminal-pro-B-type natriuretic peptide (NT-proBNP) in the entire cohort of critically ill patients. The ROC curve depicts the relationship between the proportion of true positives (Sensitivity) and the proportion of false positives (1 – Specificity) of different thresholds of NT-proBNP concentrations when tested to predict cardiac dysfunction. Diagonal segments are produced by ties. The area under the ROC curve was 0.76 (95% confidence interval 0.69 to 0.83). Predictive value of N-terminal-pro-B-type natriuretic peptide (NT-proBNP) for cardiac dysfunction. The cutoff of retained NT-proBNP concentrations was 500 ng/L. The estimated post-test probabilities for different pre-test probabilities are shown, assuming constancy of the positive likelihood ratio for NT-proBNP of greater than 500 ng/L (Post-test +) or of the negative likelihood ratio for NT-proBNP of less than 500 ng/L (Post-test -). Pre-test probability and post-test probability were defined, respectively, as the probabilities of cardiac dysfunction before and after a diagnostic test (NT-proBNP) result was known. In addition, a stepwise logistic regression model revealed that NT-proBNP (OR = 1.01 per 100 ng/L, 95% CI 1.002 to 1.02), ECG modifications (OR = 11.03, 95% CI 5.19 to 23.41), and OSF score (OR = 1.63 per point, 95% CI 1.17 to 2.41) adequately predicted cardiac dysfunction. The goodness-of-fit of the model was acceptable (Hosmer-Lemeshow: χ2 = 5.27, degrees of freedom = 8, P = 0.728), and the area under the ROC curve of this model was 0.834 (95% CI 0.77 to 0.90). When age, creatinine clearance, troponin, or sepsis was forced into the final model, these variables did not change the model. Lastly, in our study, NT-ProBNP was not independently associated with outcome (Table S1 and Figure S4 of Additional data file 1). This study, which is the largest of its kind in critically ill patients, demonstrates the relevance of NT-proBNP in the exclusion of cardiac dysfunction at ICU admission. However, our study also confirms the variability of NT-proBNP in critically ill patients and illustrates the limits to its interpretation. We investigated the possible effects of age and creatinine clearance on NT-proBNP levels. The presence of renal insufficiency or advanced age was correlated with NT-proBNP concentration. This finding is consistent with previous reports . We showed that, despite the effects of age and creatinine clearance on NT-proBNP levels, a single measurement of the NT-proBNP level at ICU admission might rule out cardiac dysfunction in this population, independently of age or renal function. Over the past decade, several studies have indicated that cardiac dysfunction is a frequent and important factor that determines the outcome of critically ill patients . It has been estimated that as many as 15% to 30% of ICU admissions are complicated by some degree of myocardial injury and that as many as 40% of patients with severe sepsis have cardiac dysfunction. Therefore, measurement of NT-proBNP might be a useful tool to rule out cardiac dysfunction. However, this large cohort study confirms the large dispersion of NT-proBNP values at ICU admission. Indeed, NT-proBNP levels are higher and more variable in our study than in selected populations of patients with ischemic heart disease or in the emergency department [13, 14]. This fact might explain the relatively poor positive predictive value in our study. In addition, our results confirm that careful evaluation of the pre-test probability is required to interpret the NT-proBNP measurement correctly. Our study has several limitations. First, the decision to evaluate a non-selected population of critically ill patients might be criticized. Indeed, the selection of patients on the basis of reason for ICU admission or of suspected cardiac dysfunction might modify the incidence of cardiac dysfunction and, therefore, the levels of NT-proBNP. However, the objective of this study was to evaluate NT-proBNP at ICU admission and not in a selected population of patients with acute respiratory failure. Another limitation is the interpretation of creatinine clearance in the ICU. Although we agree that several biases limit the interpretation of such evaluations of renal function, our results show an association between calculated creatinine clearance and NT-proBNP levels and are in accordance with those of previous studies [15, 16]. Echocardiography was performed at various times during ICU stay, including at discharge in several of the patients. This design may have induced a bias and may have led to an underestimation of the accuracy of the investigational marker. Nevertheless, none of the included patients developed any significant cardiac event that may have affected the results of the echocardiography. Lastly, NT-proBNP was measured only at ICU admission. Indeed, time course of NT-proBNP may be interesting and helpful to diagnose cardiac dysfunction. However, the main objective of this study was to evaluate the diagnostic performance of the marker at ICU admission in an unselected population of critically ill patients. The present study, which examined a cohort of unselected patients admitted to the ICU, indicates that NT-proBNP is useful to exclude cardiac dysfunction in this population. However, the high variability and dispersion of NT-proBNP values necessitate careful evaluation of such biomarkers in this setting in order to interpret the results correctly. Additional studies are needed in order to evaluate time course of NT-proBNP in critically ill patients and to confirm our results. The presence of renal insufficiency or advanced age was correlated with N-terminal-pro-B-type natriuretic peptide (NT-proBNP) concentration. Despite this correlation, a single measurement of the NT-proBNP level at ICU admission allowed us to rule out cardiac dysfunction in the studied population, independently of age or renal function. Our cohort study confirms the large dispersion of NT-proBNP values at ICU admission in a non-selected population of critically ill patients. Careful evaluation of the pre-test probability is required to interpret the NT-proBNP measurement correctly. IC participated in study concept and design, acquisition of data, analysis and interpretation of data, drafting of the manuscript, and critical revision of the manuscript for important intellectual content and had full access to all of the data in the study and takes responsibility for the integrity of the data and the accuracy of the data analysis. J-PQ participated in study concept and design, acquisition of data, analysis and interpretation of data, drafting of the manuscript, and critical revision of the manuscript for important intellectual content. BB participated in study concept and design, acquisition of data, and critical revision of the manuscript for important intellectual content. J-MD, M Degrés, and PG participated in acquisition of data. M Darmon participated in analysis and interpretation of data, drafting of the manuscript, and critical revision of the manuscript for important intellectual content and performed statistical analysis. BS participated in critical revision of the manuscript for important intellectual content. All authors read and approved the final manuscript.